Did you know parents who live in cities and parents who live in more rural areas tend to favour different type names for their babies? According to a large-scale new study by Nameberry, city-dwellers around the world share cosmopolitan name tastes and favor sophisticated baby names that are often ahead of the general trends. To conduct their research, the baby name website analyzed views of their name pages for the past year by visitors from seven cities in four countries on three continents — New York, Los Angeles, Chicago, Dallas, Toronto, London, and Sydney. What they found is pretty interesting –many of these unique name favorites that reflect their city’s style and population, such as Jack in outgoing Sydney and Helen in buttoned-up Toronto, Maeve in Irish New York and Amara in Latino Dallas. Chicago parnets love new and modern as fresh as the frontier, while London-based mums and dads prefer their names as ancient as their rich history and medieval castles. London parents are more likely to use time-honored first names than parents in our other cities, but also more likely to explore obscure sources in search of distinctive choices. Some of the favorite names of Londoners are inspired by the heavens, for instance: Aurora, Astrid, and Andromeda. Londoners also are partial to names associated with Ancient Greece and Rome: Cassius, Penelope, and Cressida. 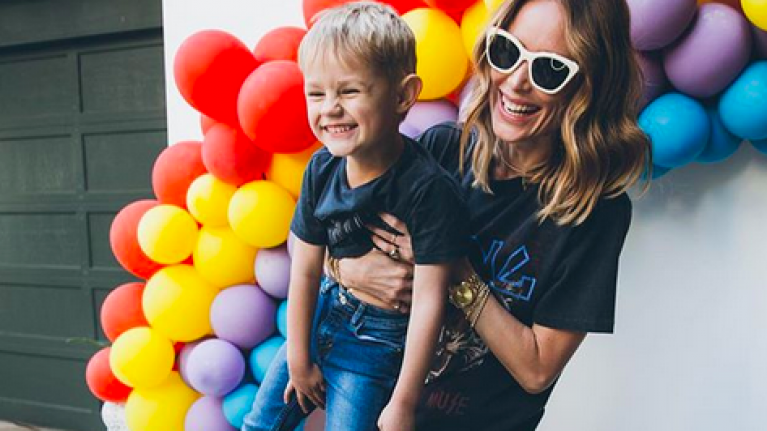 And they draw from names rooted in other European cultures that urban parents outside Europe largely ignore, such as the German Ottilie and Otis, the Italian Cosmo, the French Elodie, and the Irish Rafferty and Orla. New York is the headquarters of the publishing and magazine industries, a place where authors are still stars and people are more likely to read books than to take in a movie or head to the beach. That literary bent shows in New York’s taste in baby names. The most popular boys’ name in New York City is Holden, as in Catcher in the Rye‘s Holden Caulfield, which doesn’t pop up in a significant way in any other city. And the extended girls’ list is filled with the names of literary characters (Beatrice, Ophelia, and Penelope) and authors (Iris, Edith, and Lydia). 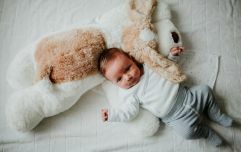 Many of the names that are big in Sydney bring to mind a warm, cuddly image: the Teddy Bear inherent in Theodore, children’s book characters Eloise and Matilda, and down-to-earth Jack. The British influence is evident in names such as the Scottish Isla for girls and Hamish and Lachlan, both in the boys’ Top 20. Sydney’s favorite names also include a unique choice that nods to its world-class beach culture: Cove. Toronto is the city whose favorite names are the most distinct from all the others, with not a single Top 5 name appearing on any other city’s list. Further, many of the favored names of Canada’s largest city don’t appear on any other popularity lists of any kind. Boys’ favorites Cary and Ellison have not been on the US Top 1000 for decades, while Helen and Jocelyn lie outside the Top 100 everywhere. But that makes sense for a major city that prides itself on a culture that’s neither American nor British nor even purely Canadian but uniquely Torontonian. Chicago is the city that comes closest to favoring the New American names so popular outside US urban centers. Greyson, Finn, Declan, and Isla are names that have come into widespread use only in the past 20 years. And looking just below the Top 5, we see other newcomers like Kai, Nolan, and Cole on the boys’ side; and Aria, Luna, and Kinsley on the girls’ side. As city baby names go, Chicago’s are the least citified. If there’s one thing that sets Los Angeles apart, in both its character and its taste in baby names, it’s the world of film and TV. Oscar is one of the top 5 boys’ names and Milo — as in hot actor Ventimiglia of This Is Us — ranks higher here than in any other city. Many of the popular girls’ names are associated with movie stars past and present: Ava, Sienna, Celeste, Claire. The favorite names of Angelenos also connect to the city’s Latino culture, with Isabella in the Top 5, Leo and Elena in the Top 10, and Xochitl, an unusual Mexican name which comes from the Nahuatl word for “flower,” in the Top 20. Amara, Dallas’s Number 1 name for girls, is a bold multicultural choice (it has roots in Esperanto and Igbo), largely unknown outside the US. The Top 5 in the Texas city includes other distinctive choices, such as Rose (as in the Yellow Rose of Texas) and cowboy name Wyatt. 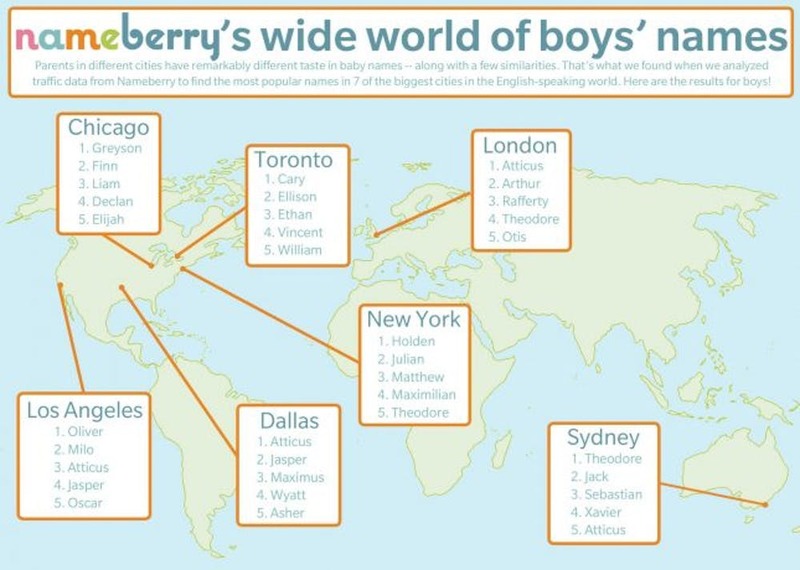 Further down the list, Dallas extends its reputation for individuality with New World names like Brecken and Weston for boys and Khaleesi for girls.